Apple's newly redesigned iPad Air and "higher-than-expected" iPad mini sales will drive overall iPad shipments to 23.1 million units for the fourth quarter of 2013, Kuo said in a research note obtained by AppleInsider. Apple will see a 102 percent quarter-over-quarter boost in iPad with Retina display shipments in the first quarter of 2014, bringing the total up to 4.5 million units. This is based on low supplies of the tablet at launch and seasonal demand. While the analyst is upping sequential growth estimates for overall iPad shipments to 64 percent quarter-over-quarter to accommodate seasonality, specifically for holiday shoppers, he sees that number slipping 42 percent at the start of 2014. 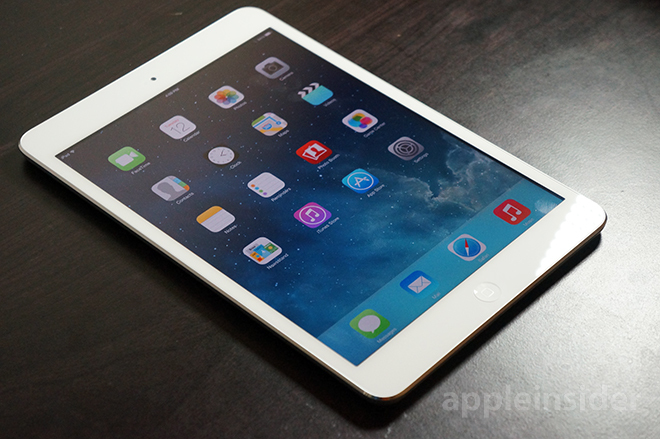 According to Kuo, shipments will dip to 13.3 million units due to seasonality and slower sales of the iPad Air. Shipments of the larger iPad will fall from 10.5 million units in quarter four to 6 million units next quarter, down 43 percent. Accounting for the change is cannibalization from the Retina iPad mini and what Kuo calls "structural challenges" to the tablet sector. "We think current tablet products can, generally, sufficiently meet entertainment needs. As they are very cheap already, lowering prices won't effectively stimulate demand," Kuo writes. "Only new applications, which will bring about new growth momentum, will be able to solve the structural problems the sector faces." As for the non-Retina iPad mini and iPad 2, Kuo forecasts the tablets to ship 8.5 million and 1.7 million units in the December quarter, respectively. As with the iPad Air, sequential shipment growth will fall a respective 72 percent and 82 percent to a respective 2.4 million units and 0.3 million units. Finally, given the iPad 2's price and positioning in Apple's lineup, Kuo believes the tablet may reach end of life in the first quarter of next year.